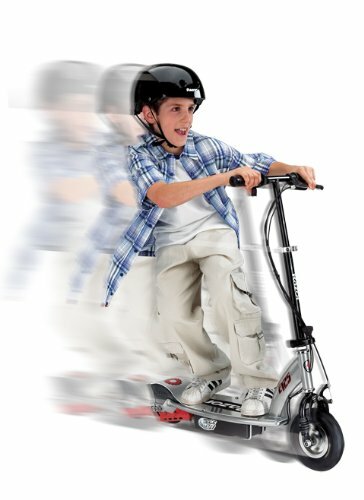 The Razor E125 is the perfect entry level electric scooter for kids 8+. Features a powerful electric engine with speeds up to 10mph ! Up to 40min continuous use on fully charged battery. New chain driven motro and twist grip design. Cruise around the neighborhood in style with the Razor E125 electric scooter. 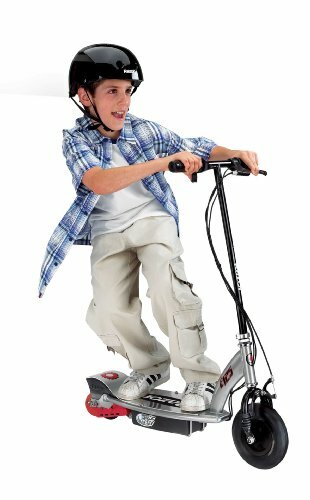 Boasting a chain-driven, high-torque motor, and a handy twist-grip throttle, the E125 is the perfect device for pre-teens and teens wanting to zip over to a friend's house or head to the park. 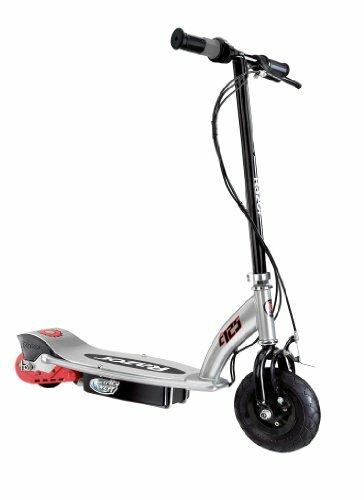 Unlike Razor's E300S and E500S scooters--whose motors start from a standing position--the E125 requires a small manual kickoff to 3 miles per hour before starting (the rider presses a trigger to engage the motor). Once the rider is on the move, however, the electric motor ramps up to 10 miles per hour--fast enough to have fun, but not fast enough to be a menace on the street or sidewalk. And thanks to the long-life rechargeable battery, which takes about eight hours to fully charge, riders can cruise for up to 40 minutes at a stretch. Other details include a folding handlebar mechanism for easy storage and transport, an 8-inch pneumatic front tire and 4.9-inch polyurethane rear wheel, and a hand-operated front brake. The E125 is recommended for ages 8 and older and offers a maximum weight capacity of 120 pounds. It also comes with a pair of 12-volt batteries, a charger, and tools and is backed by a 90-day warranty. The buyer and rider of the E125 scooter are responsible for knowing and obeying all local, state, and federal regulations regarding the riding and use of scooters. Sleek electric scooter with high-torque, chain-driven motor and twist-grip throttle Requires a small manual kickoff to 3 mph before trigger engages motor Adjustable handlebar adapts to riders of all sizes; hand-operated front brake Motor cruises at speeds of up to 10 mph Recommended for ages 8 and older (120 pounds max weight); 90-day warranty Initial charge time: 12 hours. Charge the battery prior to use. Recharge time: Up to 12 hours, even if the light turns green. Recommended maximum charging time is 24 hours. Run time: Up to 40 minutes of continuous ride time. Run time may vary depending on riding conditions, climate and/or proper maintenance.